Market was great and I picked up many new and fun items! Things are still arriving and it's like Christmas everytime the UPS or FED EX driver arrrives. 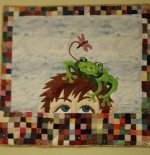 We have many new classes coming up and hope that you will join us for learning, and fun. Row by Row starts on the 21st and we are excited about meeting lots of new faces and hearing about everyone's travels. Today through Saturday July 10th, All Olfa Rotary cutters and Blades are on Sale 25% OFF. 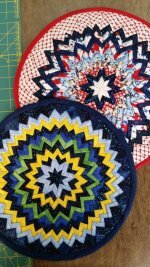 Use clothesline and fabrics to create your own unique design of coasters, trivets and placemats to make any table look extraordinary. Using this method, you can also make handbags, totes and bowls. Come and try this fun one out! We still have a few spaces left in this class. Give us a call today to get in! this years Row is called Sled Row. And keep an eye out for our new lap quilt that combines all of our snowman rows! 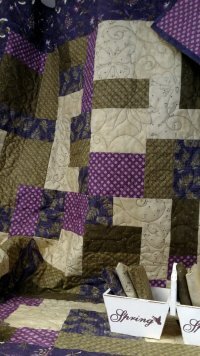 Have fun creating this Pineapple quilt, the easy way! No strips, then cut with a special ruler! Cut your pieces to fit, then add 4 to a block at a time. Fast, easy and Fun! Uses the Marti Michell Pineapple ruler in the 1" or 1 1/4" finished size. Hoppin Bobbin will be CLOSED on Tuesday, July 4th. 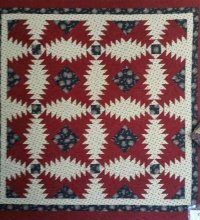 What a fabulous classic quilt this is! And you have the option of making it one of two sizes! Double or Crib, both have the same number of blocks and pieces. Make it easier and use the Marti Michell Log Cabin Ruler, Set N, Set B and her Setting Triangle Ruler. (Or you can use the paper templates that are included in the pattern) If you've been collecting her Templates and Rulers during our Marti and Me Clubs, this is a great pattern to try them with! Looking for that special centerpiece? This Folded star Centerpiece is amazing! Match the colors in any room. Using contrasting fabrics, you can create quite the conversation piece!